For many of us, our faithful canine companion is one of the reasons we love living in Mallorca. 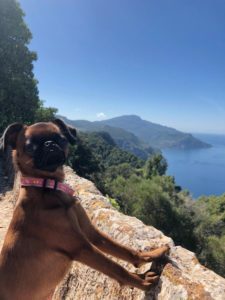 We asked Nikol Vlkova, the manager of Charles Marlow’s West Coast rentals and the proud owner of a Smooth Coat Brussels Griffon named Zoey, how she makes the most of dog-friendly Mallorca. Having a dog has been proven to help lower blood pressure and cholesterol levels. The reason is pretty obvious. As any owner knows, most dogs can’t get enough of walking, one of the healthiest forms of exercise there is, and it’s hard to ignore the pleading face of a dog waiting by the door. For a beach walk, Nikol recommends Es Carnatge in Palma, Cala Blanca near Andratx, Cala des Gats in Calvia, and Llenaire between Pollenca and Alcudia. Some of Mallorca’s sandy beaches also allow dogs from 1 November to 31 March. When it comes to hiking with your dog, now is the perfect time. The famous walk up to Castillo Alaro, which takes between one and two hours, is much more fun with an exuberant dog bounding ahead of you. Salt des Freu walk, which begins not far from Orient, is also wonderful at this time of year, when the river’s full and the natural waterfall is at its most impressive. If you live in Palma and have just acquired a puppy, the woods around Castillo Belver – the castle above El Terreno – is the ideal place to give them a decent run and start their training. The vast majority of dog-owners know how important it is to clean up after your pet. As with every country in Europe, there are fines for letting your dog foul a Spanish pavement. Unfortunately, in part of Palma and no doubt elsewhere on the island, dog mess is a real problem. Even if your dog is tiny and happy to fall asleep under a chair, many cafés are not keen on having them around. No dog owner would argue with that. But especially when you’ve been for a stroll with your dog or fancy a morning coffee and ensaimada after a brisk walk, it’s nice to know there’s somewhere you can sit and relax. In Palma, Nikol recommends Santina in vibrant, multicultural Santa Catalina and Bagel in the city’s intriguing Old Town. Santa Catalina is also home to the popular El Perrito café which, as the name suggests, is dog-friendly – at least outside. Treat your poochy pal to a delicious bowl of water here. I’m not sure if it’s smart, enhanced, reverse-osmosis, glacier spring water but it’ll do the job. Go for a stroll on the Paseo Maritimo in Palma or along the promenade at Portixol and you’ll see some elaborately groomed and chic-looking dogs whose owners clearly didn’t want them to let the side down. Chances are their owners have treated them to a visit to Palma Dog, the fashion boutique for dogs near the Passeig del Born in the centre of the city. Palma Dog promises ‘design, quality and health for your dog’. Or, they may have been indulged at Animal Dreams, the funky canine health spa just off Paseo Mallorca. After you’ve given your pooch a makeover, you could always stop at the hot dog stand in Placa Mercat opposite La Caixa art foundation. Long-time Palma aficionados claim it makes the best perrito caliente on the whole of the island. If you’ve chosen to raise your dog vegan – no judgement – pet superstore Tiendanimal in Palma sells plant-based food, along with just about everything else you’d ever need. They have a comprehensive online store and it looks like they also deliver. Nikol takes Zoey to Pedro Darder Clinica Veterinaria in Son Rapinya, Palma where, she says, they’re always ‘super nice’. When it comes to insurance, Mapfre has a very good inexpensive insurance policy for pets. 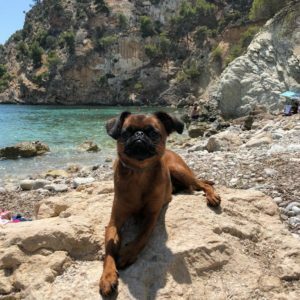 If you’ve just moved to the island and are contemplating a dog, you could make a difference by adopting from the Palma municipal dog shelter Son Reus. Their website is in English and German. The Asociacion Peluditos Son Reus takes dogs out of the Son Reus shelter and fosters them. 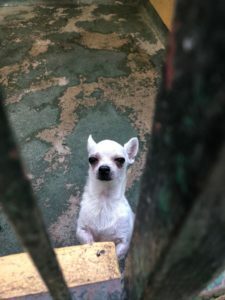 Their website is in Spanish, but they have an active Instagram account on which they encourage people to adopt dogs that are in danger of being put down. Follow Zoey on Instagram. Why not? Over 6,000 dog-lovers already do.